I must have a magic knitting gnome living in my knitting basket because it seems that these socks appeared out of nowhere! I mean, did you see me knitting them? Nope! But here they are, and they come with quite a story. Click on the extended entry to read more. 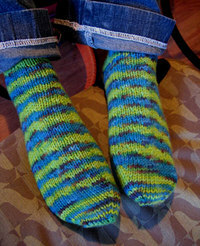 Several months ago, Paula and I agreed to a sock exchange – I knit a pair for her, and she, for me. Before even a second e-mail was exchanged regarding this swap, I knew exactly the yarn I wanted to use – Art Yarns Supermerino. 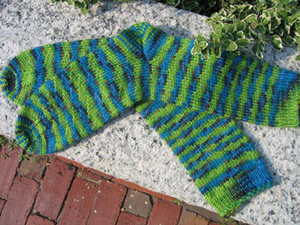 I had seen Kate knit with this luscious yarn, and I had heard many great reviews elsewhere. Of course I consulted with my buddies – Kate gave this idea an approving nod, Colleen advised me on colorways, The KnittingZone supplied the stuff, and I was ready to go. Mmm hmm, colorway 106, also known as, perfection! And then things got gloomy. Paula started buying Art Yarn stuff. She was in a tizzy, and so was I! She was buying Art Yarns like it was going out of style! I nervously read her e-mails and blog, waiting for the moment she would buy the exact colorway I had chosen for her. She didn’t disappoint – voilà! How many of you received a panicked e-mail from me that day? Thank you for keeping me calm, for encouraging me to cast on. And that was that! Fortunately, Paula hasn’t knit up that colorway into a sock yet, so mine are unique. For now :). They fit, and Paula seems to really like them :). She also really liked the sock sleeve, the idea for which I blatantly stole from Carolyn. I think only a Designer like Paula would immediately pick up that, yes, that Hello Kitty matches the socks. What can I say, I’m a Photoshop ho! As for the socks Paula knit for me, they are just fabulous! So cheery and sunny and cotton! I really do love these socks – thank you, Paula! I know Paula will post a similar entry soon (uhm, as soon as I e-mail her the photos from my camera), so go over to her blog and read more! I really like the blue/green yarn you got.. Course… I would.. but ya know.. lol. Beautiful job on the socks! And on the sock sleeve! Hee, hee. The socks and the sleeve look great. I’m glad that Paula likes them (although I knew that she would; the colors are perfect). 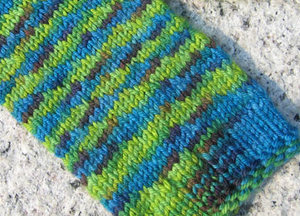 Could you post instructions for your simple slip stitch to prevent pooling? I just finished a pair of ArtYarns anklets for my SockPal and I’m a little unhappy with the pooling. Thanks! Aww, you two should go out for a walk together with your funky bright socks! I love them both! Mmmmm, Artyarns Supermerino. I’m using color 106 for my Sockapal2za socks. I bought additional colorways to use for Chrsitmas socks. Love the sock sleeve idea. Beautiful socks and a great idea the sock sleeve is. I think both socks are awesome! 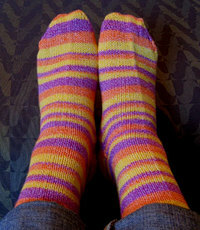 But I especially like the colourway of the pair Paula made for you … as you said, cheery and sunny! Congratualtions on your sock exchange. The socks look great! Love the sleeve…your version is fabulous! I love the colors of blue and green. Nicely done. That’s really one of the nicest striped socks I’ve seen, in the way the striping works out. How much of the supermerino did it take for the pair? The socks look great. What method did you use for the heel? Mine never look that good. No matter what I try I always get those holes. CUTE socks – both pairs. 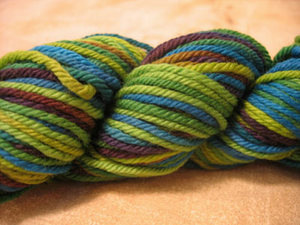 What a fun swap and I really like the art yarns supermerino. I may have to give some a try. What FUN socks! Both pairs look just great. And I LOVE the sock sleeve – stolen or not, it’s just such a perfect finishing touch. I LOVE the socks (both the ones you made and the ones made for you.). I also LOVE Artyarns….my LYS had a sale recently and many skeins were available for $5 each…can’t tell you how many I bought, but none in the colorway that you used. I would love to see a patters for those socks…the striping is fantastic. The socks you made for Paula are wonderfully designed, and oh the LABEL, too cute! I can’t believe you even put a tip on the label as to how to knit them. And the color-coordinating kitty! Such attention to detail. You clearly are a scientist. I’ll bet your knitting notes look like lab notebook entries. Those socks you knit for Paula are adorable! And I hope you don’t get too hot in the cute ones she knit you! Beautiful sockss! Great job on those. I also would love it if you would post the simple slip stitch pattern to get the nice variations you got out of that artful yarn. Thanks so much.